'How do we explain that on the economic, internal security and strategic fronts, India's unstable coalitions have acted more decisively and boldly than all our full-majority governments yet?' asks Shekhar Gupta. National Security Advisor Ajit Kumar Doval is being unfairly attacked for saying, in his Sardar Patel Memorial lecture, that for the next 10 years India needs to be a hard power and must have a stable, majority government. It shouldn't be objectionable. The NSA isn't a civil servant. He's a political appointee and doesn't need to hide his voting preferences. I won't even fight with him if he had gone a step further and said that such a strong and decisive government could only be provided by Narendra Damodardas Modi. I would argue with him not on his political proposition, but on his fundamental argument. That only stable, strong, full-majority governments can be good for India. And that coalitions are unstable, confused, waffling, indecisive, corrupt and open to blackmail. It doesn't pass a fact-check. Let's focus on the economy first, because data is non-partisan. Our political history can be divided into two stability epochs. The 1952-89 period, 37 years, saw almost total stability. There were a couple of hiccups in the late 1970s, but generally one party ruled at the Centre and in most of the states. As decades passed in this apparently virtuous epoch, the government became more stable, more strong, controlled by one party, which in turn was owned by one unchallengeable family, the Gandhis, finally with almost an 80 per cent majority in the Lok Sabha (1984 to 1989). If the new, stable=strong=decisive Doval Doctrine is correct, these four decades should have given India the best growth. The reality is, it gave us the below-4-per-cent 'Hindu Rate of Growth'. Is it a coincidence that economic reform in India was timed to perfection with the end of stable, full-majority governments? The first after the Congress party's decline, V P Singh's short-lived one, does not quite pass the test. But the big reform wave, which India is still riding, was brought in by P V Narasimha Rao's government. It was a very unstable, minority government. After Rao lost in 1996, India got effectively five prime ministers heading rickety coalitions and three elections in the next eight years. We say five prime ministers because, besides the short H D Deve Gowda and I K Gujral governments, we had Atal Bihari Vajpayee as prime minister thrice: First for 13 days, then just about a year, and finally an almost full term. Now think. Which is our most reformist Budget after Manmohan Singh's in 1991? It was P Chidambaram's 'dream budget' in 1997, which widely cut rates and taxes and also brought in the Voluntary Disclosure of Income Scheme. The same government also set up the national Disinvestment Commission and opened the door for the listing of PSUs and ultimately privatisation. This was the forever doddering Gowda-Gujral arrangement, which we often derisively called a government on daily wages. Funnily, it was also supposedly the most Left-of-Centre government in our history. It started out with two Communist ministers for the first and only time in a central Cabinet yet: Indrajit Gupta, home; and Chaturanan Mishra, agriculture. Vajpayee had the strength to launch the Golden Quadrilateral of highways, privatise Delhi and Mumbai airports, and sell 11 profit-making PSUs and nearly two dozen ITDC hotels. A footnote: In four-and-a-half years of an all-powerful Modi government, not one company has been sold, not even a dud like Air India. A short interlude in this 15-year period of instability between 1989 and 2004 was Chandra Shekhar's -- of only about four months until it became caretaker. We ridiculed it as a 'cash-and-carry' government. He had about 50 MPs of his own and depended on the outside support of the Congress. But it dared to airlift India's gold out to avoid a balance of payments crisis. I am not sure if any full-majority government, even Narendra Modi's, would dare to do so. He also brought in Yashwant Sinha as his finance minister and Manmohan Singh as his powerful economic advisor who could attend Cabinet meetings. These two were the architects of our reforms in subsequent years, all in 'weak' coalitions. Check out the basic comparison: Our average growth rate in the 37 perfectly stable years was below 4 per cent. In the subsequent 25, it went well over six, now establishing a new normal of 7-plus, almost twice as much as the old 'Hindu Rate of Growth'. On economy, we have a perfect inverse graph between political stability and economic growth. But what about national security? Isn't a coalition government less capable of looking after the hard national interests? In my view, India has never had a weak government on issues of national security, except V P Singh's in 1989-1990. Doval served under that government too and watched in frustration the situation in Punjab and Kashmir go out of control because of its missteps. He did, however, get an opportunity soon after. In Punjab, I have written before, that every 'A' category Khalistani insurgent killed could be described as 'caught Gill, bowled Doval'. It was a brilliant operation between the Intelligence Bureau and Punjab Police that destroyed the insurgency. In the same 1991-1996 period, Kashmir, at its worst ever yet, was brought back in control. It wasn't by employing soft-State measures. 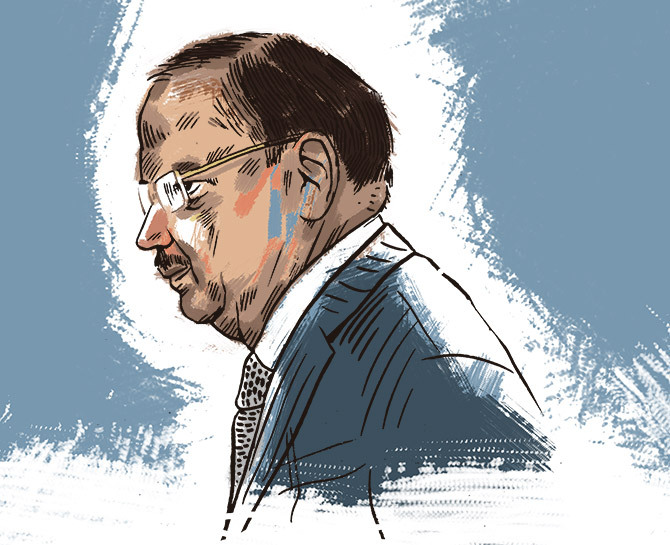 If this 'fix' is the most creditable feature on Doval's impressive CV, he needs to thank a weak, minority government, under a prime minister with zero charisma. At her peak, Indira Gandhi's didn't have the spine to call Pokharan-1 a nuclear weapons test. It dished out that 'peaceful nuclear explosion'; hypocrisy. Vajpayee's 'weak' coalition had no such hesitation 24 years later. And how weak was it? It fell within 11 months of Pokharan-2, losing by one vote in Parliament. Since I am on to a good argument, I am not about to let go yet. In the post-1971 India, if Pokharan-2 was the boldest strategic decision, what's been the second? The India-US nuclear deal was signed by Manmohan Singh in UPA-1, when his coalition depended on the Left. He risked his government in a parliamentary vote and brought about a fundamental shift in India's strategic worldview. In UPA-2, he took a similar risk, over FDI in multi-brand retail. The Modi government subsequently hailed the nuclear deal as a great blessing. It has, however, failed to move on FDI in multi-brand retail. There is no ideological hang-up there, as something of the sort has been allowed in e-commerce. It is just that the government is risk-averse despite the majority. How do we explain that on the economic, internal security and strategic fronts, India's unstable coalitions have acted more decisively and boldly than all our full-majority governments yet? We aren't a country of a billion-plus nut-cases. We are simply a good, buzzing democracy, run by responsible, hard-working, and thick-skinned, politicians. They aren't perfect. But they know what is good for them. They want to win elections, and, once they have the power, don't want to lose it. If the economy grows, there is public peace, a sense of security, a happy people will re-elect them. A coalition is unstable, but it forces our leaders to negotiate, trade for space, listen to others, fish in a larger talent pool. A secure, majority government makes politicians complacent, arrogant and create unsustainable personality cults. From Indira to Rajiv to Modi, that is the lesson of our political history. India has no need to be afraid of coalitions. Can Modi lead a coalition?